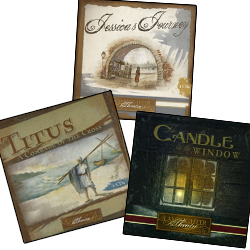 Buy all three of our latest theatre dramas: Jessica's Journey, Titus, A Comrade Of The Cross, and Candle In The Window. From B.Paul of San Antonio, Texas on 3/14/2016 . Absolutely fabulous and entertaining! Lamplighter Theatre has done it again by providing excellent productions that focus on lifelong lessons of Christian virtues. Our family loves sitting around the computer and using our imaginations as we are transported back in time by a super talented cast of actors who bring to life wonderful stories. From Jenni de Vries of Walkaway, Australia on 6/1/2015 . As with all Lamplighter stories my family has listened to, we were riveted from the start. The stories were engaging and challenging to our life and faith. Titus, Comrade of the Cross was sometimes hard going. Probably wouldn't recommend it for younger listeners. Great story, but I couldn't listen to it over and over again, it's a bit sad. As for Jessica's Journey and A Candle in the Window, we've only had them for a couple of weeks and we've already listened to them several times. Thanks Lamplighter! Many blessings. From Helena Clark of Highlands Ranch, Colorado on 3/5/2015 . We love Lamplighter Theatre. My daughters could listen to these over and over for hours. I got tired of listening to the same ones, so I decided to purchase additional seasons! From R Novak of Cleveland, Ohio on 8/27/2014 . I think the stories are excellent in content and dramatic delivery. They have been great companions when traveling in the car for a long distance! My grandson likes them as much as I do. From Anonymous of Byars, Oklahoma on 5/18/2014 .